We hope this Guided Tour will give you an impression of PROSE and how it can be used. The tour is based round the fictional "International Seminar on Protocols", ISP05. You might also like to look at the Conferences and Journals sections of this site to find out about the review process that PROSE automates. 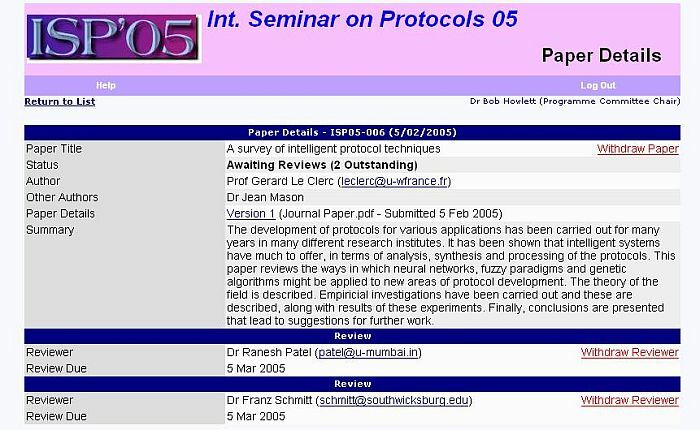 When we set up a PROSE event (for a journal or conference) we allocate the event a URL or web address with its own subdomain, for example www.kesjournal.prosemanager.com for the KES Journal, or www.isp05.prosemanager.com for the International Seminar on Protocols. This subdomain address is yours for as long as PROSE is used to manage the event. It helps promote a professional image for your event. When a user clicks on the address allocated for the event a screen similar to the one shown here will be displayed. Conference / journal personnel, for example the Editor or Chair, Reviewers, etc., will have been allocated a User Id and Password. If they enter these log-in details they will taken to an area of the PROSE site appropriate to them (see later in the tour for examples). The "Forgotten Password" link enables users to be sent a new password by email on presentation of their User Id and email address. The User Id and password must exactly match the details held by PROSE. Online help is available from each PROSE page by clicking on the Help link. The help screens are context sensitive, the help is specific to the page from which it was called, which aids the user to find the information they need. Clicking on the Submit a Paper link on the Login screen takes an author to the PROSE online Paper Submission page specific to the event. The author enters personal information, their name, affiliation, contact details, etc. The paper abstract is entered into a text box, and the author may browse their computer to indicate the location of the paper itself, which must be in PDF format. On clicking on the submit button on the page the paper is uploaded into PROSE and the accompanying information is stored in the PROSE database. At this point the paper is allocated an identifying code, and password, which the author may use to log in to PROSE and check on the progress of the paper. An email confirming receipt of the paper is also sent to the author at the email address they have supplied. Note that a direct web address for the Submit Paper screen for your event is available, which you may build in to your event web site if you wish. The reviewers, if they have been allocated, and whether the review has been completed. Clicking on the Show Paper Titles link causes the titles and authors of the papers to be displayed in addition to the other information. Where the paper carries a red flag, it indicates the need for action on behalf of the Editor or Chair. For example, this might be the need to allocate a reviewer, or make a decision on publication when completed reviews have been entered. Clicking on the Version 1 link causes the full text of the paper to be displayed. As well as providing information about the paper, this screen carries links to allow various operations to be carried out, for example, to allocate or withdraw reviewers, withdraw the paper, etc. Reviewers are allocated by reference to a Reviewers Database, which contains details of their research interests to aid the selection of a reviewer with appropriate skills. When a reviewer is allocated PROSE sends an email to them notifying them of their allocation to the paper. This screen summarises the papers that have been allocated to this reviewer. Papers where action is required (for example, that a review must be entered) are highlighted with a red flag. If the reviewer does not wish to undertake the review, they may indicate this by clicking on the Reject Review Request link. If the reviewer clicks on the Add Review link they are taken to a screen containing an online review form. The reviewer uses this form to indicate their view of the paper using several check boxes, and also to provide textual comments. In addition they indicate whether the paper should be Accepted, Accepted subject to specificed modification being completed, or Rejected. Note that a reviewer cannot see details of the review provided by another reviewer. When an author logs in they see details of their paper (note that a login is specific to a paper, not an author). When a reviewer has completed a review, it can be seen by the author when they log in. The author cannot see either reviewer's identity. When both reviews have been received and a decision has been reached about publication, the decision and accompanying comments can also be seen by the author. 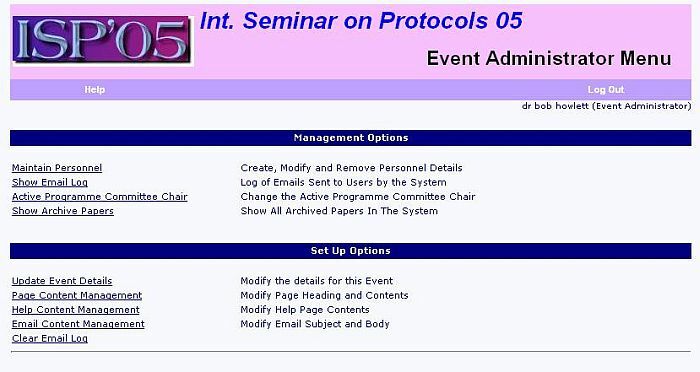 The Event Administrator is likely to need to use the Management Options from time to time while the conference/journal (the Event) is in operation. This includes access to the User Database to update information and add new users. It is also possible to look at a log of all emails that have been sent to users, inspect archived papers etc. The Set-Up Options are used to change the basic features of PROSE and the way it is set up. This includes changing the appearance of PROSE and setting the logo and menu colours. It is also possible to edit the email messages sent to users, the help screens, and the text of the user screens. This provides a considerable level of flexibility. PROSE allows considerable customisation of the appearance of the web pages. The colours of headings, heading text, etc., is customisable. The logo of the conference or journal can be uploaded, and this will then appear in the PROSE banner, giving the PROSE site for the event a corporate identity. Some examples of combinations of colours to give KES different appearances are shown on the right of this page. In addition, the text of the standard emails that are sent out to users can be customised. The text of help screens can similarly be edited. If desired, the text of the main PROSE web screens can also be edited. PROSE makes comprehensive use of email to automatically notify all PROSE users that action is required by them, that decisions have been reached etc. This removes much of the load from conference organisers or journal editors. and both login and paper submission screens will be available. We hope you have found this brief tour of PROSE useful and informative. Of course there are a number of features of PROSE that it has not been possible to show during a short tour like this. If you are interested in using PROSE for your conference or journal, please contact us at . We can give you access to a live demonstration PROSE event, so that you can try out uploading papers, allocating reviewers, completing review forms, etc., and see how PROSE can save you time. Thank you for taking the time to experience this guided tour!